Mr Umar Asiimwe(2ndR) and co-accused appear in court on Tuesday. The man claiming to be the rightful king of Ankole Kingdom is to spend one week on remand at Mbarara Central Prison after he was charged with, among others, promoting sectarianism, and disobeying lawful orders. Mr Umar Asiimwe and four others appeared before Mbarara Chief Magistrate Court presided over by Ms Sanyu Mukasa on Tuesday to listen to the charges of unlawful assembly, forming and being members of unlawful society, promoting sectarianism, inciting violence and disobeying lawful orders. 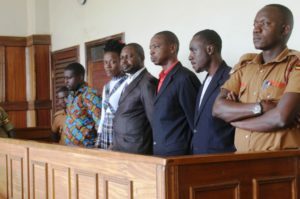 However, they denied the charges and were sent to jail until February 27 when they return to court for bail application. Prosecution told court that they committed the offences between October 2017 and February 2018. Mr Asiimwe and the co accused were arrested last Thursday for allegedly refusing stop their activities on matters related to the creation of a cultural institution in Ankole. Mr Asiimwe was on October 29, 2016 “consecrated King” (Omugabe) of Ankole. He established a palace Itaaba Kyabanyoro, Rwampara County in Mbarara where he has been conducting activities relating to kingship. He appointed 20 ministers and 17 county chiefs to help him in his work.